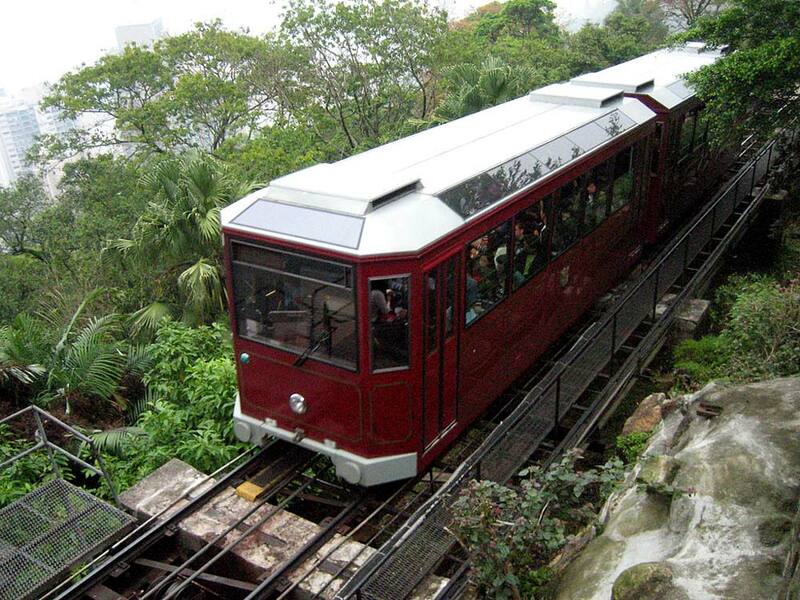 The Peak Tram is called a funicular, or cable railway, and is located in Hong Kong. It carries both residents and tourists to the upper parts of the highly visited Hong Kong Island. The tram runs from the central district area to Victoria Peak. This route is the most direct one and it offers visitors wonderful views of Hong Kong Harbor and the city’s skyscrapers. Hongkong and Shanghai Hotels Group own and operate the tram. The tramway’s route from Hong Kong’s Central district area to Victoria Peak is almost one mile. Its height from the ground level to the top is about 1,300 feet. This line has two very pronounced curves, one that goes to the left immediately when it leaves the lower level terminus, and one in the middle of the ascent that goes right. It is a one track route that has one passing loop, and two trams. Garden Road station is the lower level terminus and it is close to St. John’s Cathedral. Its first station was part of the St. John’s Building which was an office building. This station has one single track and platforms on each side. One platform is for boarding, and the other is for exiting. The upper terminus is located at Victoria Gap, under the Peak Tower leisure and shopping complex. It is about 500 feet below Victoria Peak’s summit. This station has the exact same type of boarding arrangement as the lower station. All of the tramway’s control equipment is situated in the basement below this station. Alexander Findlay Smith developed the Peak Railway project in 1881, and then presented it to Hong Kong’s governor. The required legislation approved the plan two years later. It took about three years to construct the tram because most of the heavy machinery had to be manually hauled up the hill by workers without any mechanical support. This tram was a very revolutionary form of transportation in Asia once it was completed. The Peak Tramway opened in May of 1888 and it was divided into three different classes which included the first class area for Victoria Peak residents and British colonial officials, second class was for Hong Kong’s police force and British military, and third class was for everyone else, as wells as animals. In its history, the Peak tram has only suffered two natural disasters which were caused by heavy rains that washed away some of the track’s steep sections. The first occurred in 1899, and the other was in June, 1966. In 1926, the electric motor was replaced with a steam engine. On December 11, 1941, in the World War II Battle of Hong Kong, the tram’s engine room was seriously damaged during the attack. Service did not resume again until December of 1945, following the conclusion of Japan’s occupation of the city. The system was refurbished in 1989 and a new track was installed with a new computerized control system. New two-car trams were also added and they have a capacity of one hundred and twenty passengers in each tram. Today, more than four million people ride it every year and it averages about 11,000 people every day. A reproduction of the tram’s first car is exhibited in the Peak Tram’s historical gallery.